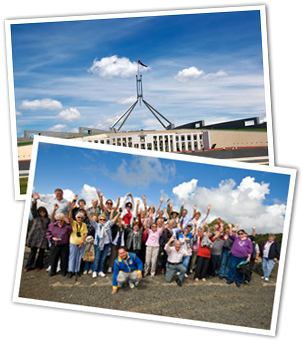 Transborder Express is a long-established Canberra based company specialising in conference delegate transportation. We offer the most modern fleet of vehicles in the region with luxury 5 star seatbelted, air-conditioned and DVD equipped coaches ranging in size from 24 to 52 seats. Air-conditioned mini buses are also available. Our drivers are trained professionals with excellent local knowledge and commentary experience. Let us take the hard work out of your Conference Charter needs. Contact us for an obligation free quote and to discuss your next conference group outing. Transborder Express work closely with a number of tour providers and we encourage you to take a look at what these companies have to offer for organised tours.